Happy Friday! I'm super excited about this weekend as we get closer and closer to the thirteen days of Halloween. This weekend is going to be awesome since I'll be doing to Frightfest at Six Flags. Fingers crossed that it doesn't rain! I'm already prepping my nails for the occasion and I'll be using one of the polishes I'll be showing you today. 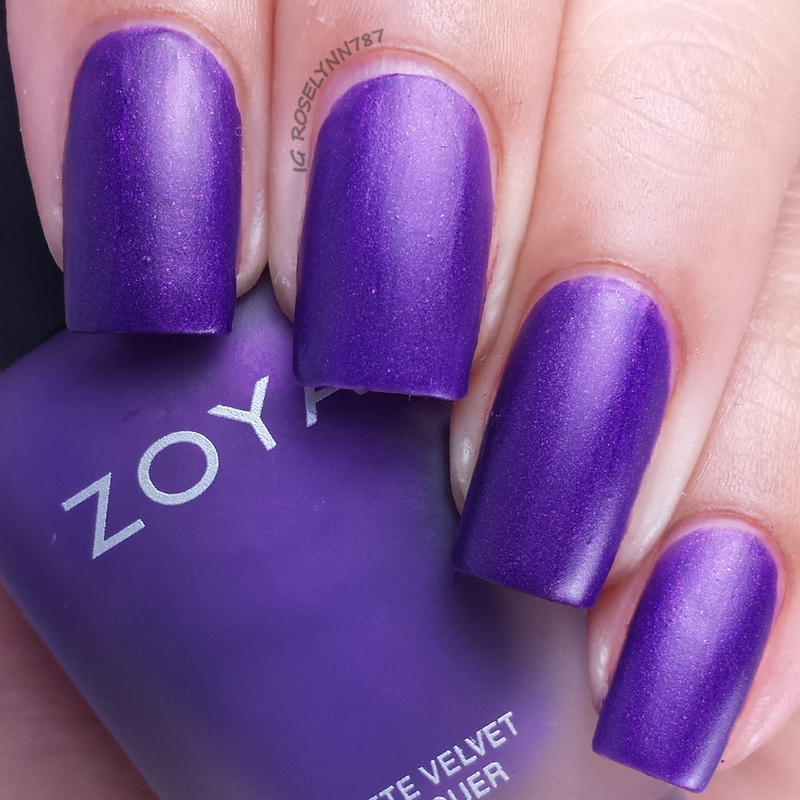 It's definitely a post full of awesome-sauce today ladies because I'll be showing you the much anticipated Matte Velvet Collection by Zoya! Yes, they are all back! 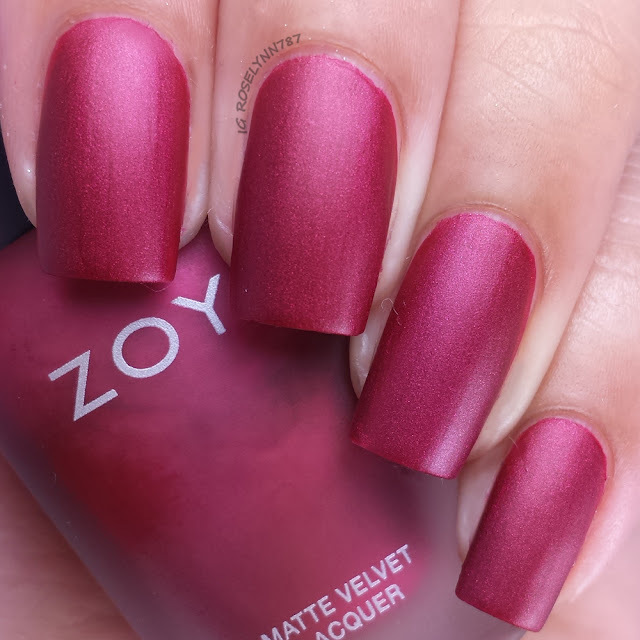 The Matte Velvet Collection by Zoya is already available for purchase on their website. These polishes were initially released last year for the winter holiday season and they sold out so quickly I was never able to purchase the full collection. I'm beyond excited about this! In an effort to save some time, I'll only be doing brief descriptions for each polish in this collection since they share the same formula. You'll find that six polishes have a great consistency, not too thick nor too thin. Each of the polishes required two thin coats to be fully opaque. 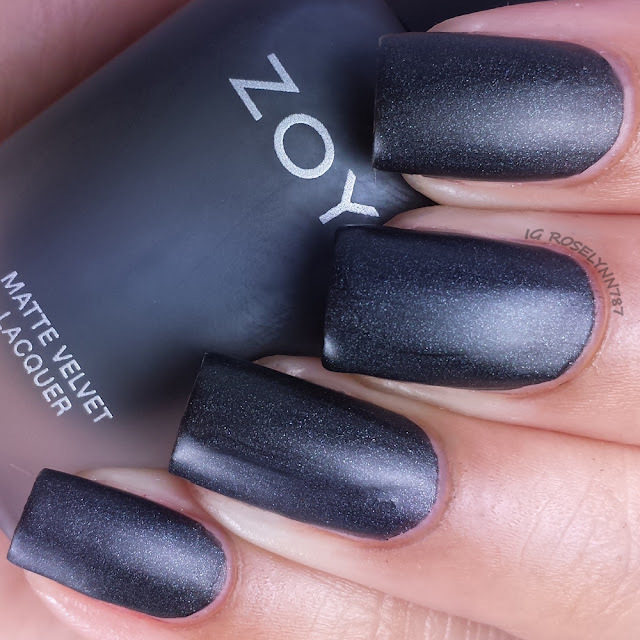 The Matte Velvet Collection is not intended to be worn with a base coat or top coat of any kind. 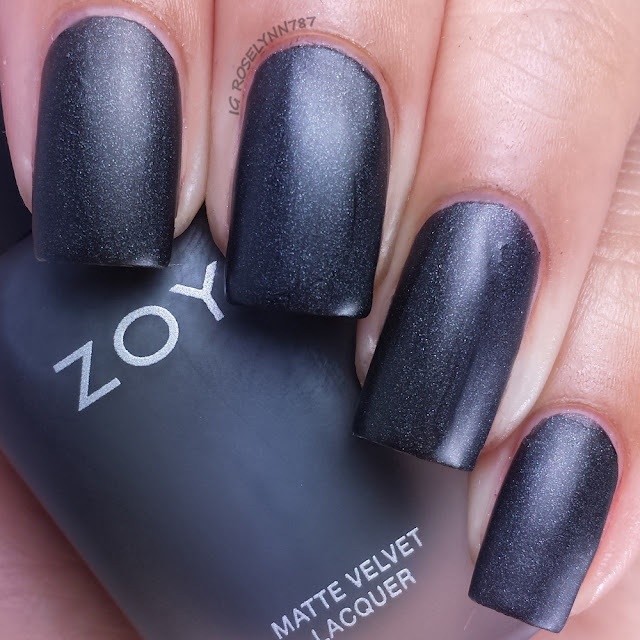 Dovima can be described as a smoky charcoal-black with strong silver shimmer and a velvety MATTEVELVET finish. Very punk and edgy shade. I seriously feel like a badass wearing this smoky color today. Definitely fitting for Halloween as well. 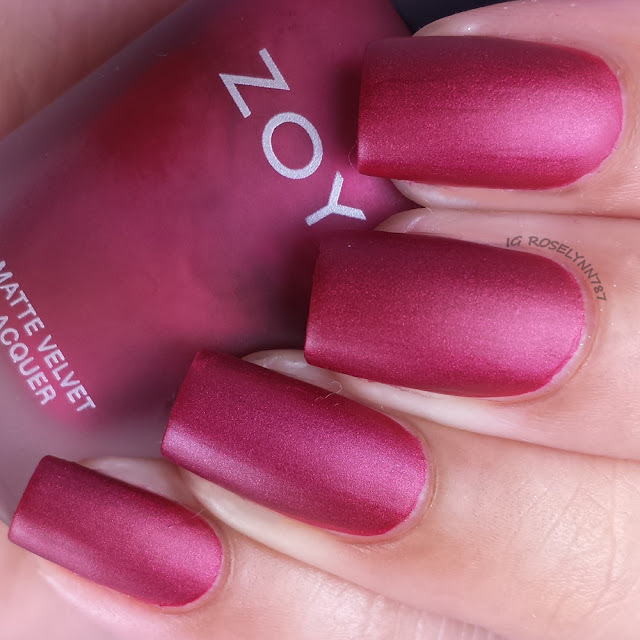 Posh can be described as a medium cool-toned wine red with metallic red shimmer and a velvety MATTEVELVET finish. This was one of the ones I was able to purchase last year and I wore it all through Christmas. It's perfect for the holidays. Savita can be described as a bold, vibrant medium purple with strong red and gold shimmer with a velvet MATTEVELVET finish. Poptastic purple! At first, I thought perhaps this color would clash too hard against my skin tone. I'm happy to say that's not the case at all and it looks so awesome against my skin. 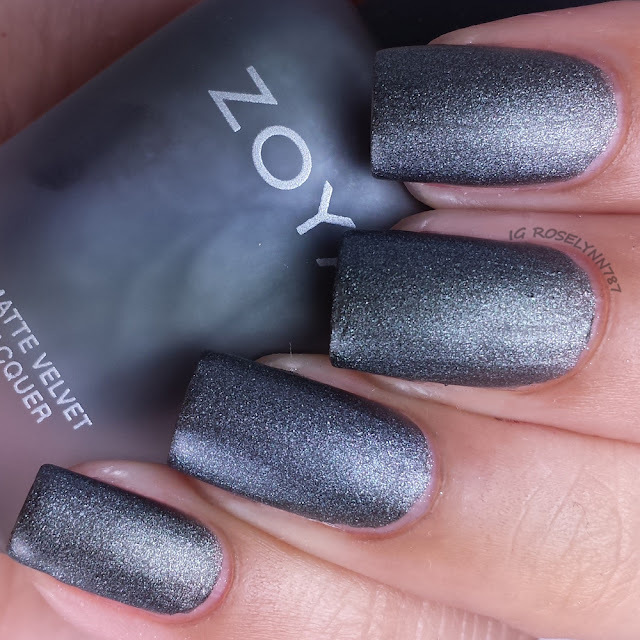 Loredana can be described as a medium gunmetal grey, packed with silvery shimmer and a velvety MATTEVELVET finish. If I had to pick a least favorite, this one would be it. I think it's because I was expecting it to be a lighter shade of gray. 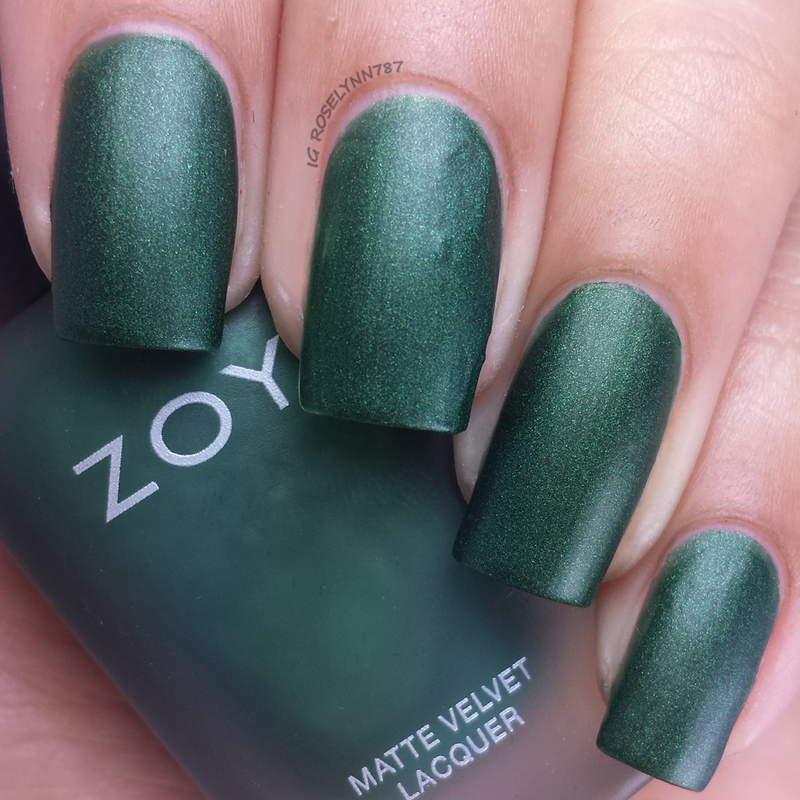 Veruschka can be described as a deep evergreen garnished with strong metallic shimmer in a velvety MATTEVELVET finish. Doesn't this remind you of a Christmas tree? I swear I couldn't stop humming holiday jingles as I swatched this one. Harlow can be described as a rich, saturated rose plum packed with sparkling metallic shimmer in a velvety MATTEVELVET finish. 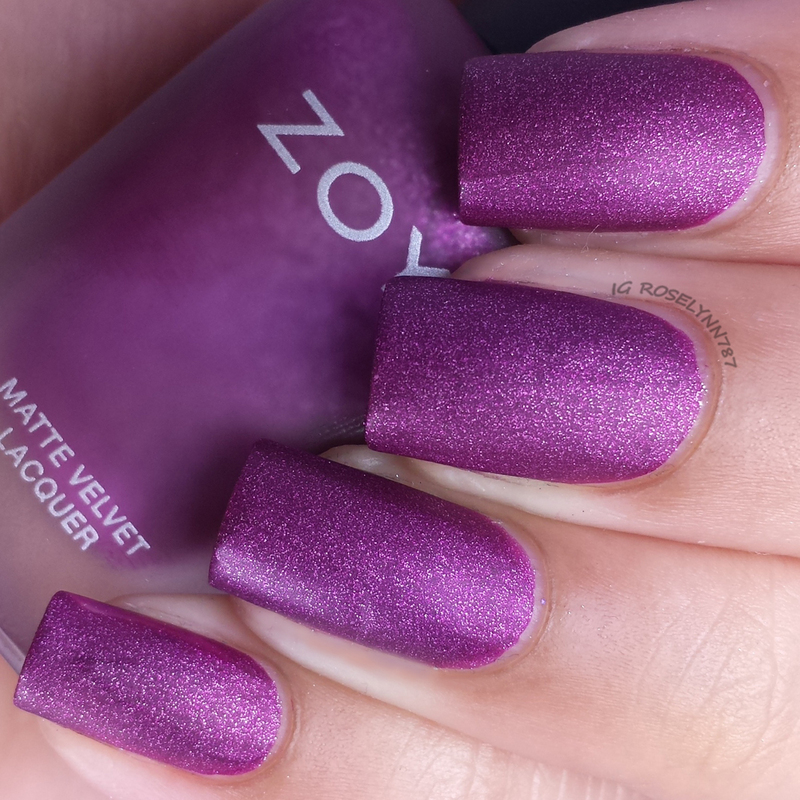 This particular one is so much more stunning and sparkly, because of the combination of matte and shimmer. It's definitely one of my top picks from this entire collection. 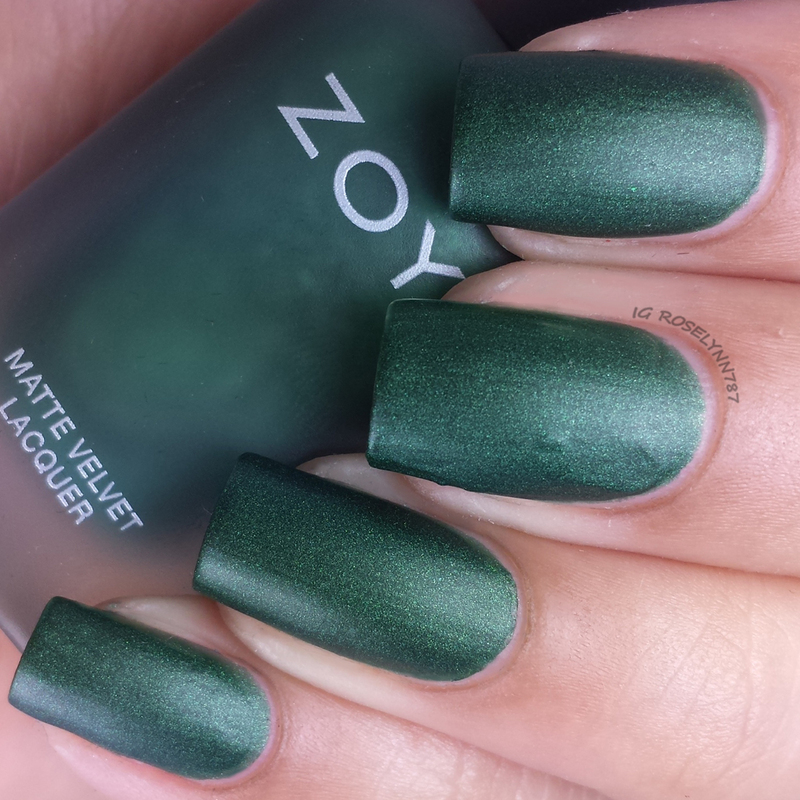 Overall I'm really impressed with the matte finishes and the quality of each of one of the polishes. I have been a fan of matte polishes before this collection so that definitely helps my love for them. One or two of them had a little bit of strange smell to the application. It wasn't particular strong or anything like that - it was just different than the rest so I thought it was worth mentioning. Also with these polishes you have to give it enough time to dry in order to get the full effect of the matte finish. I had to allow it around five full minutes to dry and see the matte shimmer finish. The dry time is totally worth it though because as you saw in this post the shimmer matte finishes are exquisite. The Zoya Matte Velvet line is now available for purchase for $9.00 each. 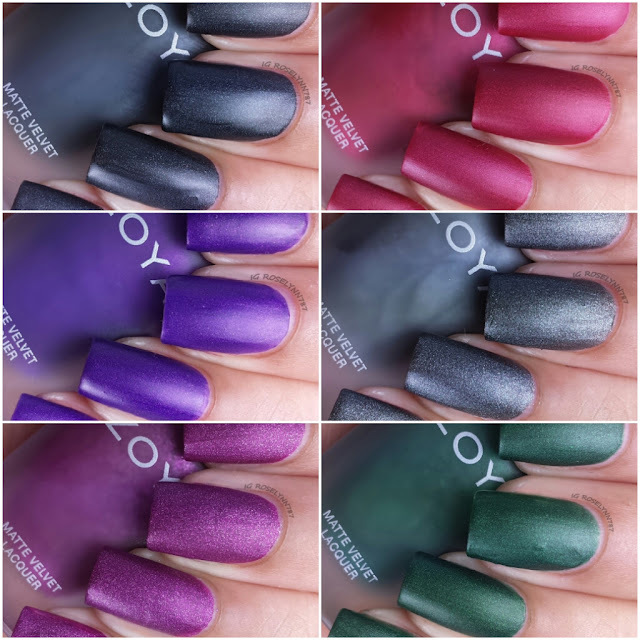 As always, these polishes can be purchased at Zoya.com or at your nearest Zoya retailer. So tell me guys, which one is your favorite?